Relieving symptoms of seasonal allergies such as runny nose; sneezing; itchy, watery eyes; or itching of the nose and throat. It may also be used for other conditions as determined by your doctor. 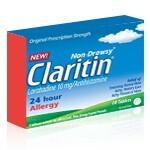 Claritin is an antihistamine. It works by blocking a substance in the body called histamine. This helps to decrease allergy symptoms. Some MEDICINES MAY INTERACT with Claritin. However, no specific interactions with Claritin are known at this time. Ask your health care provider if Claritin may interact with other medicines that you take. Check with your health care provider before you start, stop, or change the dose of any medicine. Use Claritin as directed by your doctor. Check the label on the medicine for exact dosing instructions. • Take Claritin by mouth with or without food. • If you miss a dose of Claritin , take it as soon as possible. If it is almost time for your next dose, skip the missed dose. Go back to your regular dosing schedule. Do not take 2 doses at once. Ask your health care provider any questions you may have about how to use Claritin. • Taking Claritin in high doses may cause drowsiness. Do NOT take more than the recommended dose without checking with your doctor. • Claritin may interfere with skin allergy tests. If you are scheduled for a skin test, talk to your doctor. You may need to stop taking Claritin for a few days before the tests. • Claritin should not be used in CHILDREN younger than 6 years old without checking with the child's doctor; safety and effectiveness in these children have not been confirmed. • PREGNANCY and BREAST-FEEDING: If you become pregnant, contact your doctor. You will need to discuss the benefits and risks of using Claritin while you are pregnant. Claritin is found in breast milk. If you are or will be breast-feeding while you use Claritin, check with your doctor. Discuss any possible risks to your baby. • Severe allergic reactions (rash; hives; itching; difficulty breathing; tightness in the chest; swelling of the mouth, face, lips, or tongue); severe or persistent dizziness. Store Claritin at room temperature, between 68 and 77 degrees F (20 and 25 degrees C), in a tightly closed container. Store away from heat, moisture, and light. Do not store in the bathroom. Keep Claritin out of the reach of children and away from pets.